Leaf feeding, or defoliation, is the most common type of insect injury that growers will often observe. Over the past 30–40 years, much research has been directed toward understanding the economic damage that wil occur when soybeans are defoliated. Defoliation will usually be seen twice during the growing season; first during the early vegetative stages soon after plant emergence, and then during soybean reproductive stages in July and August. Early planted soybeans, especially in the first fields to emerge in an area, may exhibit seedling injury due to feeding by overwintered adult bean leaf beetles, Mexican bean beetle populations, and slugs. Foliar injury from insects again becomes more common beginning at flowering stages in July and continuing through August and into early September. Defoliation during this time can be from either a single insect species acting alone, or more commonly, from a complex of insect pests all contributing to the overall level of leaf feeding. The BLB is a small beetle that varies in color from golden yellow to red, generally having six black spots on the wing covers, and always having a black triangle on the area centrally behind the thorax (fig. 1). The BLB overwinters in the adult stage, and resumes activity in the spring. It will be found feeding on soybean foliage soon after soybean emergence (fig. 2). The overwintered BLB adults feed on foliage and deposit their eggs in the soil. Unless beetle densities are abnormally high and feeding significant (> 40% leaf loss), this early season defoliation is usually not considered economic. If a soybean field is late planted relatively to other fields in the area, the first generation may not become established in the field and the probability of early season BLB damage is minimal. However, if planted late and missing the first generation, the likelihood of the field staying green in September enhances the chance of having a higher second BLB generation, and thus, more pod feeding. Figure 1. Bean leaf beetles. Photo by R. Hammond. Figure 2. Bean leaf beetle feeding damage on soybeans after emergence. Photo by R. Hammond. Bean leaf beetle passes through two generations in Ohio with the true first generation of BLB beetles appearing in early summer when adult feeding resumes (fig. 3). The second and final generation appears around late August or early September when it is more of a pod feeder. The time of peak occurrence of BLB adults per generation may differ from field to field depending on the date of planting because the time of initial egg laying in a field depends on the time of initial emergence of the crop that attracts the overwintering beetles to the site. Growers should see the fact sheet "Bean Leaf Beetle on Soybean, ENT-23" on ohioline.osu.edu for more information on BLB. The MBB adult is a small, copper-colored beetle with numerous black spots, while the larva is yellow with black spines (fig. 4). The adult beetle resembles a lady bug or beetle because they are all members of the same family of insects, Coccinellidae. MBB are one of the few members of this family that are plant pests. The MBB also overwinters as adults in wooded areas near fields, entering soybean fields as they emerge from their overwintering sites. As with the BLB, earlier planted fields will tend to receive the majority of the overwintered adults. MBB also has two generations per year, but unlike BLB whose larvae occur in the soil feeding on roots, both the adult and larva will feed on soybean leaves. Thus, when scouting, growers need to be aware of both stages of this pest. Figure 3. Bean leaf beetle damage on soybeans in early summer. Photo by R. Hammond. Figure 4. Mexican bean beetle adult (left) and larva (right). Photo by R. Hammond. The GGS (fig. 5) is often a problem in soybeans grown using conservation tillage practices, especially no-till. While able to cause significant stand reduction from feeding on germinating plants, GGS can also inflict significant defoliation to young soybean plants (fig. 6). Unlike the other pests discussed, foliar insecticides will have no impact on GGS or other slug species. Management comes from tilling the soil and the burial of crop residues, or the use of molluscicide baits. Growers should see the fact sheet "Slugs on Field Crops, ENT-20" at ohioline.osu.edu for more information on GGS. Figure 5. Gray garden slug. Photo by R. Hammond. Figure 6. Gray garden slug defoliation of young soybean plants. Photo by R. Hammond. The JB adult (fig. 7) is a larger beetle that can cause significant defoliation to soybean. JB can feed on over 200 plant species, soybean being just one of them. Their larvae, or grubs, occur in the soil around grassy areas and can sometimes be a problem in field crops, although this is not common in Ohio. The behavior of the JB is unique in that it gives off various pheromones that attract other beetles. Thus, adult JBs are usually found in masses rather than as single individuals. Because of this aggregating behavior, they are not spread throughout the field like many insects, but usually occur in groups. When sampling for JB and their feeding, a grower must scout across the whole field to see how damaging the population is over the entire field. Also, JB are often more numerous along field edges, so it is important to move away from the edges of fields when scouting. JP feeding tends to skeletonize the leaves (fig. 8). Figure 7. Japanese beetle adult. Photo by R. Hammond. Figure 8. Japanese beetle feeding damage. Photo by R. Hammond. The GCW, a Noctuid moth species, is the only lepidopteran pest that is common and sometimes a concern on Ohio soybean. The damaging stage is a green-colored caterpillar with white longitudinal stripes along its body (fig. 9). It has three pairs of prolegs, which is an identifying characteristic. Also, when held in your hand, GCW larvae will often shake violently, which is a defensive mechanism against predators. The adult GCW migrates into Ohio each year from southern U.S. locations; there are two generations in Ohio. Seldom does the GCW occur in large densities by themselves to cause economic concern, although this occasionally does occur. When migrating populations are large, it is usually the first GCW generation in July during early soybean reproductive stages that can cause economic concern. When this does occur, the second generation will usually not occur in high numbers because a fungal pathogen, Nomuraea rileyi, will usually cause the population to crash. If the first generation is low, which is typical, the second generation will usually only add to the defoliation from other soybean defoliators. Numerous grasshopper species (fig. 10) will often be found in soybean, often at high numbers feeding on both leaves and pods. When sampling, growers will usually find that most of the grasshoppers occur on the field edges, having come in from grassy borders. Figure 9. Green cloverworm caterpillar. Photo by M. Shepard. Figure 10. Grasshoppers feed on soybean leaves and pods. Photo by M. Kogan. On rare occasions, soybean growers will find other defoliators in their fields. Although interesting, they usually are not found in densities that will cause concern, or add appreciably to the overall defoliation levels. A late spring insect is the painted lady, also known as the thistle caterpillar (fig. 11). This insect migrates from southern states each year. Larvae will usually be found inside leaves webbed together. Another insect is a very unique looking caterpillar known as the silver spotted skipper (fig. 12), another butterfly. Also, late in the season growers often find numerous yellow woollybear caterpillars (fig. 13). While these insects are often quite noticeable, they do little damage, and at most, only contribute to the overall defoliation. Figure 11. The painted lady, also known as the thistle caterpillar. Photo by R. Hammond. Figure 13. Yellow woollybear caterpillar. Photo by D. Keith. Figure 12. The silver spotted skipper. Photo by R. Hammond. Early planted soybeans, relative to other fields in the area, may attract large numbers of overwintering BLB and MBB. Periodic inspection of early planted fields is advised, especially if the field in question is the first to emerge in an area. Although economic injury is relatively rare at this time of the season, severe leaf feeding can cause significant damage and should be stopped if defoliation goes over 40%, plants are being stunted, and beetles are still actively feeding. In late June and July, when the first generation of BLB and MBB adults begin to appear, or the other insect pests make their presence known, field visits along with periodic sweep net sampling for determination of pest population abundance should be initiated plus periodic assessment made of defoliation injury. Sweep net sampling will provide a measure of pest abundance and facilitate an awareness of trends in insect activity. Sweep net sampling should be taken as sets of 10 sweeps at 3 to 5 locations in a field. For defoliation assessment, 20 random plants should be pulled from the soil and an estimation of the percent defoliation made. 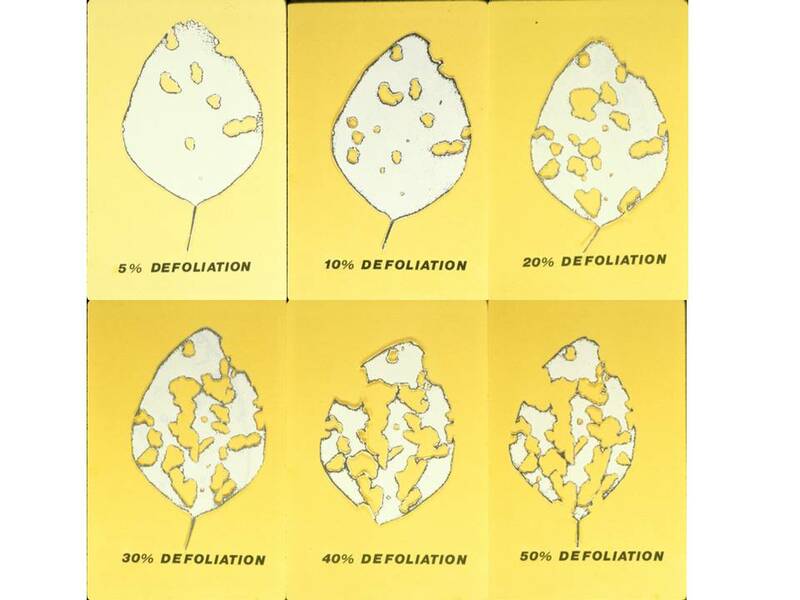 Defoliation is determined by comparing the actual defoliation to a chart of defoliation levels (see fig. 14). Care should be taken to estimate the percentage over the entire plant, not just the top third. Often, the level of defoliation is much higher on the top portions of the plant, with relatively little on the lower two-thirds. During periods of insect activity in mid-summer, defoliation is usually a result of a complex of insects feeding rather than a single pest species. Decisions to apply an insecticide rescue treatment are based primarily on the observed defoliation caused by the total pest complex and continuing insect activity. Rescue treatment is justified when defoliation exceeds: 40% prior to bloom, 15% from bloom to pod-fill, and 25% after pod-fill to plant yellowing. Insects should still be present and active. When the decision to make a rescue treatment is made, there are numerous foliar insecticides to use. See Ohio State University Extension Bulletin 545, Control of Insect Pests of Field Crops, for those insecticides labeled on soybean, or for all insecticides labeled on soybean. The Agronomic Crops Insects website (entomology.osu.edu/ag) contains Bulletin 545 as well as fact sheets on many of these insect defoliators. Additional information is available from your local Extension office or The Ohio State University Entomology Agronomic Crops Insects website (entomology.osu.edu/ag).